On behalf of one of our generous donors, IN THE BAG presents the Hermés Kelly 35 cm Bag. Dating back to 1930, the Kelly is one of the most iconic and exclusive treasures of the House of Hermés. 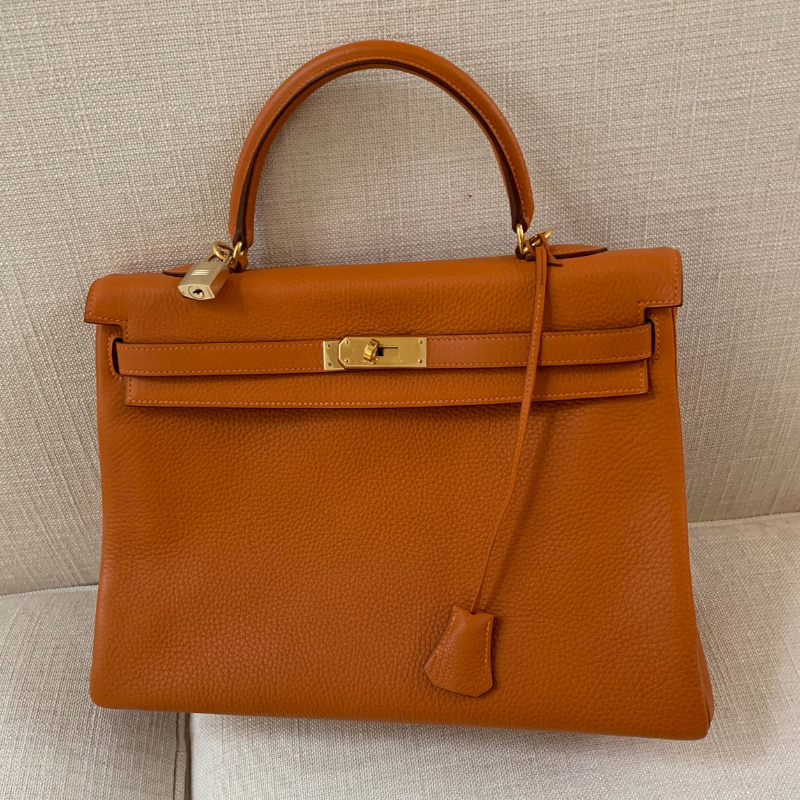 This beautiful bag, in Hermés logo orange, is the 2006 model and has never been used. You can take the plastic off of the hardware yourself 🙂 It measures 13.8″w x 9.8″h x 5.1″d, the handle drop is 3.9″ and it comes with a padlock and 2 keys. On the inside of the top leather lock strap is the stamp 23 6, and a small box with the letter j on the side, which verifies it’s authenticity. The bag has been appraised at $11,800. Not familiar with the Kelly bag? Click HERE to learn about its fascinating history. We are selling 50 tickets at a price of $250 and you do not need to be present to win. They will go fast, so get yours today. CLICK HERE. Winner will be announced on or before December 31, 2018. If you have previously purchased an IN THE BAG ticket, online drawing or online handbag drawing ticket, you will need your previous confirmation number to start the process, which came to you in email form when you first registered. Once you have entered that into the system, click the option to “modify”, then click next until you see the screen with the different ticket options.